Ww are back! 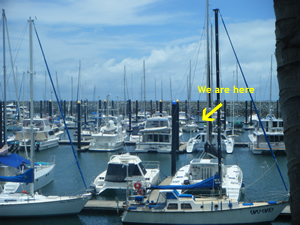 After a week in Brisbane, Rona and left this morning at some ungodly hour and arrived in Mackay at about 10.00am. We had a great time in Brisbane, Rona got her business side of things under control and I caught up with old friends and made some new ones. Thank you to Harriet for getting up and driving us to the airport. I appreciate that is a huge effort. We had done most of the top up shopping in Brisbane as we don’t have transport in Mackay. There was an interesting moment when we opened the overhead lockers “carefully, because things may have moved during the flight”. In our case it was potatoes and various vegetables that threatened to cascade upon the floor but we finally struggled off with our victuals intact. It was a glorious winters day without a cloud in the sky as we joined the boat. Unfortunately there is a tropical cyclone, Anthony hanging off the coast North East of us. Only a category one and travelling east it SHOULD present no problems. 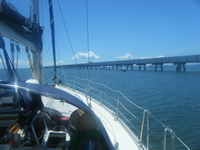 We stowed the gear aboard and started undoing the preparations that we had in case of a cyclone while we were away. 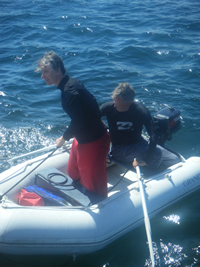 Extra lines were removed, the dinghy was brought up from below and the boat was aired. The wind is still blowing at 20 to 25 knts but the forecast is to ease from tomorrow. Given it is midday and Digby, the nearest Island south is 42 miles away we have decided to postpone departure until tomorrow when the weather will improve. 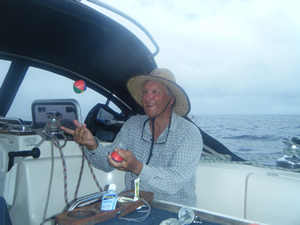 Besides, it is the 13th day of our trip, (not that sailors are superstitious, touch wood!) and the waterfront bars and restaurants at Mackay are very seductive. The day started very overcast. We heard via an sms that there had been a flash flood in Toowoomba and 8 people had died. The Brisbane River was on flood alert and the Brisbane CBD had been evacuated. Here in our world we are far removed from all this and it is hard to appreciate what is happening outside. A storm cell started to come over us so we weighed anchor and tried to outrun it. No such luck and the breakfast of egg and bacon was eaten in the rain while the crew sat below tucking into theirs. It was possible to steer round subsequent cells so once we had some sea room the rest of the course to Nara Inlet was relatively dry. About 4 miles off Nara Inlet we got wind! 10 knots, slightly off the bow so we hoisted sail, killed the motor and sailed down the Whitsunday Passage for a while before tacking for the entrance. Sailing at last! 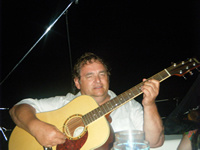 We played suitable sailing music, Christopher Cross, Little River band, Crosby Stills Nash and of course Jimmy Buffett. Lunch was lamb and oregano wraps an the world looked a lot better as we cleared the reef into Nara. Nara Inlet is one of my Favourite Harbours In The World. There ae only a few of them but this one is right up there. A long fiord like channel with absolutely still water and an abundance of wildlife. I have been here many times and really connect with the place for some reason. 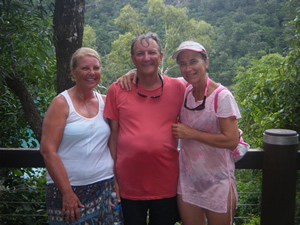 We anchored at the head of the inlet and while the others took the dinghy to see the Aboriginal Cave and the fresh water fall, I just sat on Dreamagic and soaked up the ambiance of the surroundings. We shared the inlet with about a dozen other yachts, mostly charters. This is a favourite first night stop for the fleet and I was a little worried that the exuberance of some of the crews first night afloat might ruin the stillness of the night ahead. However such is the power of Nara that the evening fell to no more than the noise of the cockatoos and the wild goats put here by the British to feed shipwrecked sailors many years ago and now flourishing in this paradise. Once dark we sat on the stern, drank wine and watched the phosphorescence in the water. A juvenile shark glided by, its dorsal fin trailing a shower of green magic dust behind it. We flicked the dinghy painter and marvelled at how the tiny green animals scattered across the still, black surface of the water. 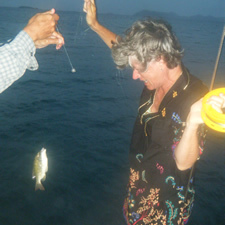 Some of the creatures got caught in the strands of the painter and it glowed as we put it back in the water. Other than our own music, Italian Opera played very quietly, there were no sounds from other yachts and only the braying of a goat looking for it’s mate in the hills dark above us. A truly memorable night. Today we lost Claire and Christian. (Very careless I know). Seriously what with no wind and no diving, (The visibility is crap because of all the rains) they finally decided that as there is an airport in Townsville and this may be their last chance for a while they should grab it. Guys, it has been a pleasure having you on the boat and I hope we stay in touch. We have wind! Not much, and blowing in the wrong direction but it does show it exists. We finally said our goodbyes, left the Frenchies with the Moke and got underway about 10am. Our options are fairly limited. Cape Cleveland is only 8 nms away, Cape Bowling Green is a respectable 60nms, Cape Upstart an ambitious 100nms, or Bowen at 140nms. Our reasoning is Cleveland is too near, Bowling Green has crap anchoring so it’s Upstart or Bowen. We decidied to make a decision when we got to Upstart. 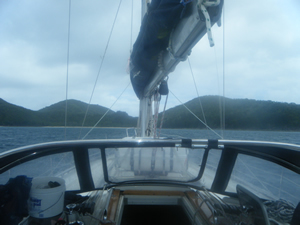 The weather was fine so with jib and motor we chugged Dreamagic along at an average of about 7 knts. The wind filled to 15knts but still jut slightly off the Port bow so we kept that configuration until Abbott Point. We were rewarded with an absolutely stunning sunset as we eat, listened to music or dozed. There were some surprising moments trying to identify the lights at Abbott Point Wharf. The yellow ones were easy, the are on the chart. The white ones were tankers and surprisingly they were not shown. At about 01.00 we were in line with Bowen and ready to make an approach. The northern entrance is marked but I have been through there in daylight and scared myself. I am certainly not keen to do it at night. We took the longer southern entrance and arrived just outside the harbour at 02.00. We dropped anchor in 5 metres of water just out of the channel markers and immediately fell asleep. 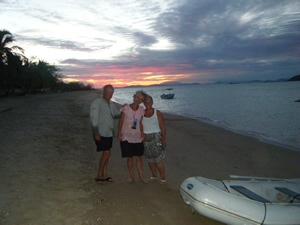 An early start due to some very threatening weather saw us around Magnetic Island and into the marina at Nelly Bay. The last time we were here was for race week. It is very different at the moment, very empty. 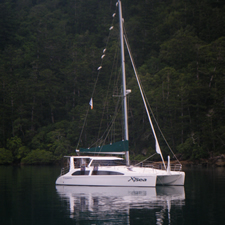 We tied Dreamagic to her berth, booked in, and went to a café for breakfast. 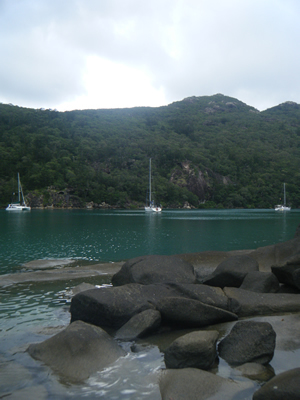 A touch of retail therapy, in my case at the hardware store for rope and glue and I spent the next hour fixing the dinghy while everyone showered, shopped or “just did their thing.” Magnetic Island is like that, very hippy. 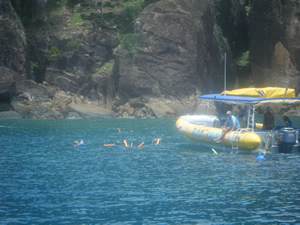 We met around lunchtime for a swim in the resort pool and lunch on board. Mark wanted to hire a mini moke to complete the transition from respectable businessman to surfer beach bum. 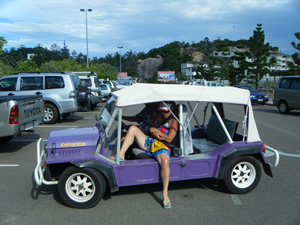 Eventually he got a purple one and he and Isobelle went to burn some rubber around the island. In the evening we found a great little pizza place and shared pizza served by ocker Aussies, washed down with red wine while listening to Spanish flamenco. 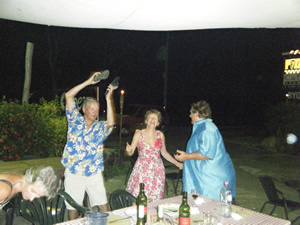 The atmosphere proved to much for some, who decided to put on an impromptu dance in the carpark. (See photo). 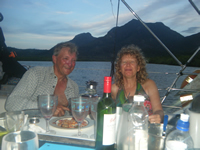 The management were impressed enough to give us two bottles of wine which followed what we had brought before returning to the boat, or in some cases sneaking into the pool for a midnight dip. We woke to another beautiful day, yet again with no wind. An early start with only a chain wrapped around the anchor winch marring a beautiful motor to Horseshoe Bay. Travelling in a boat one isn’t aware of what is happening in the outside world. The weather here is beautiful. Brilliant sunshine, blue skies. It comes as a surprise to learn that Brisbane is getting pounded by rain. 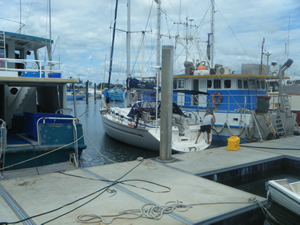 In Bundeberg, on the Burnett River 70 yachts were lost or damaged when the river flooded and washed their moorings away. 70 yachts! Bureau of Meteorology told us that the Whitsundays must expect destructive winds last night. We will be there in three days, but right now we are enjoying the best weather I can remember in a long while. During the crossing Isabelle, the human energizer bunny decided to clean. She drafted Mark and Rona cleaned the cockpit, rearranged the lazarretts, and the cabin. We then had a self cleaning session of indulgence, showering in fresh water. Our intention is to get a berth at Nelly Bay on Saturday so we can afford to be extravagant with water. It’s funny how little luxuries take on great significance at sea. 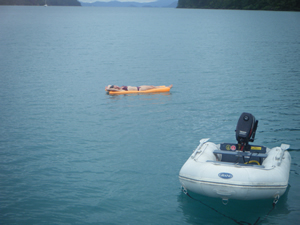 We anchored in Horseshoe Bay, the only boat here. Last time I was here was in September for the Magnetic Island Race Week and the place was packed. We dinghied ashore to one of my favourite places on the East Coast, Cottees Fish and Chip Shop. Purchasing mackerel and chips and eating them in the shed on the beach looking out at a sunset over water while drinking wine out of a brown paper bag decanted into disposable cups. A marvellous end to a beautiful day. Last night was very hot and sticky. 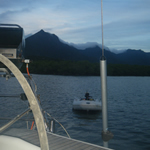 Consequently most of the crew were up to see a beautiful sunrise over Hinchinbrook. This place really has amazing beauty and has a real calming effect on the soul. That is until Isobelle dropped a pillow from her hammock over the side and had to be restrained from diving for it. The place is full of crocodiles and fortunately we persuaded her to take the rubber ducky instead. All safe on board, including a decent size fish that committed suicide by jumping in the dinghy last night, we had breakfast before making the journey to the Lucinda Jetty. The water here is very shallow in parts and although we have chosen high tide to make the crossing it is still quite technical. This is when I noticed that CMap has it’s vagaries. At Dunk it showed we were about 100 metres up the beach, here it is constantly to starboard of where we actually are. Very strange. Still we managed the crossing and at about 11.00 we were back in the Coral Sea motoring south in beautiful sunshine, and no wind. 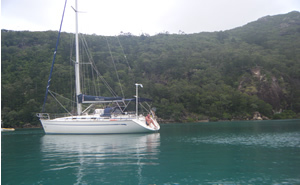 Between Fantome island and Orpheus Island there is a wide protected bay. 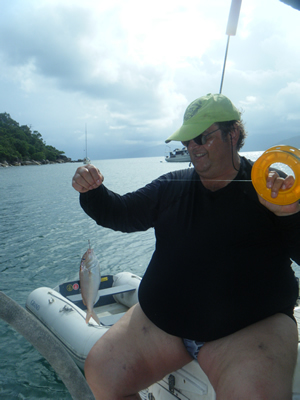 We anchored near the coral and settled down to a late lunch. 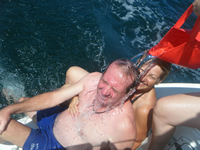 The outboard is still playing up so the crew swam in while I tried to fix the problem. It seems that the carburettor has come loose from the block and petrol is seeping through the joint. I tightened that and it now seems to work. I hope so! I am having a run of bad luck with the boat at the moment and all manner of small things seem to require attention. Dinner was a Massaman curry, while watching the lightening from storm cells over the mainland. Finally one hit us but rather than run for cover we put “The Soggy Bottom Boys” on the stereo and sat and enjoyed the coolness of the rain. Pictured is Claire and Christian performing a "Happy Dance" while it is p^ssing down. Must be French thing, but it was hilarious! thanks Guys! After a very wet night we woke to find blue skies, a flat sea, and no wind. 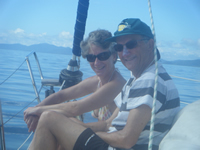 I wanted an early start so we kicked the motor over at 07.00 and motored to Dunk Island, some 60 knms away. Dreamagics’ usual routine of opening beers at 10.00 (It’s five o’clock somewhere) is spoiled by the fact that our guests don’t drink much alcohol. 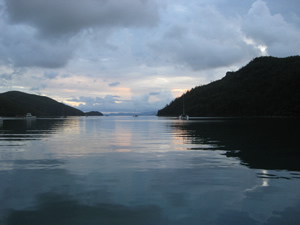 A very sober Dreamagic sailed past High Island, Russell Island and The Barnards to get a good jump on the trip. It’s so different from when we came through here in September. Then it was 30knts on the nose, now it’s 5 knts from behind. We are still motoring though! The big event was Christian demolishing the companionway stairs. He is a very big man to say the least and the bottom half of the two part stairway over the motor just pulled the screws from their housing. Fortunately I have some stainless steel screws on board and with the aid of a power drill I managed to make repair. After a magnificent lunch of Asian wraps with smoked salmon and Atlantic salmon we sat on the transom and took turns dunking each other. Wind! One hour out of Dunk the wind had reached a heady 9 knts so we hoisted sail and reached for home. Of course it dropped out as soon as we had the sails set but none the less we raced for the anchorage at the frightening pace of about 3 knts before dousing sail and dropping the pick. Christian and Claire cooked the beautiful evening meal of Moroccan Chicken washed down with a little wine before Christian serenaded us on my guitar. God, we eat well on this boat! The evening sky was crystal clear and star gazing was the sport before retiring. Last night we had guests aboard to say goodbye. Kerri and Kevin, Sue and Ken, John and Ifja, (I do have to find out how to spell her name!) 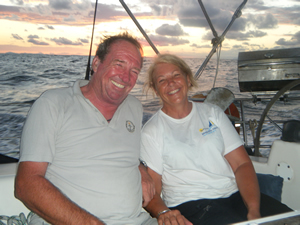 and Ian came down to wish Dreamagic well on her sail south. Thanks Guys for making the effort and I will look forward to seeing you all again soon. Early today Dreamagic’s guests for the voyage joined the boat. 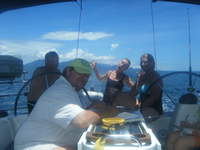 Isobelle and Mark I have sailed with before, Christian and Claire are new friends. All except Mark speak French as a native tongue and his French is very good. As we are storing more food than we took to the Louisiades aboard, and the air is thick with excited French comments about our upcoming trip I am feeling very continental, N’est pas? We had a celebratory glass of champagne with Susannah, who is Simone’s mum, and Isobelle’s sister in law, (do try to keep up!) 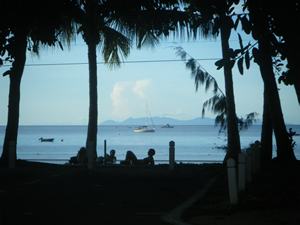 before we let the lines go and motored over to Fitzroy Island for our first night. (Or Nui Une, mai oui!) The weather was very calm with threatening clouds. 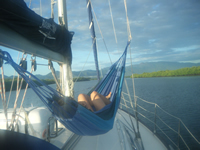 Christian fished for a while and caught a couple of unidentified reef fish on a handline, Isobelle managed to rig a hammock on the deck, and the boat settled into that lazy routine hopefully indicative of what is to come. At dusk, the clouds made good their threats as the rain decided to lash the deck during our first meal together. However, remembering Capt’n Willi’s edict about ordeal and adventure we grabbed soap and had our first fresh water shower on the deck. Nightcaps in the saloon finished the day before and early, if very hot with the hatches closed, night.